ISBN13 - 978-0921307-17-4, illustrated, deals with the Thomas 'Taylor' Ross family descendant line. Divided into 6 parts & 9 Appendis & 3 Notes. 1- Addenda 1998, name index 2007 [awf]. Part 1-- - In the Beginning Page 17. Page 15 - Dear Relative. Page 18 - Resumé of Scottish History from A. D. to 1250. Page 21 - Clan Ross' Pictish Origin and Development as a Clan. Page 22 - The Highland Clearances. Page 22 - Sir Wm. Johnston imports Crofters to his N.Y. estates among them Thomas Ross (Taylor) and his wife and son. Part 11 --- The Founders Page 23. Page 23 - Thomas Ross and Hugh Munro get settled on the Kingsborough Patent. Page 24 - The hurried Exodus to Canada In 1776. Page 25 - They become soldiers and later U.E.L.'s. Page 26 - Thomas' U.E.L. Claims. Page 27 - Hugh Munro's U.E.L. Claim. Page 28 - The disposal of the Loyalist Claims and Land Grants. Page 29 - The 1790 Petition of the Inhabitants of Lancaster Twp. Part 111 -- -The Pioneers Page 31. Page	31 - General Conditions in the new settlement in Glengarry. Page 32 - Freehold Land Tenure Established. Page 32 - Views of the settlement from diaries etc. Page 34 - Children of Donald Ross of Gen. 2. Page 36 - Winter selling and buying trips to Montreal. Page 36 - Donald's "Big Pine Tree". Page 36 - A view of Glengarry at time of Donald's death. Part 1V -- - A Time of Crises ------- Page 38. Page	38 - Family of Tom Ross of Gen. 3. Page 39 - How they lived. Page 39 - The Great Schism in the Presbyterian Church. Page 40 - Tom's death and conditions at that time. Page 41 - Transportation by land and water improves. 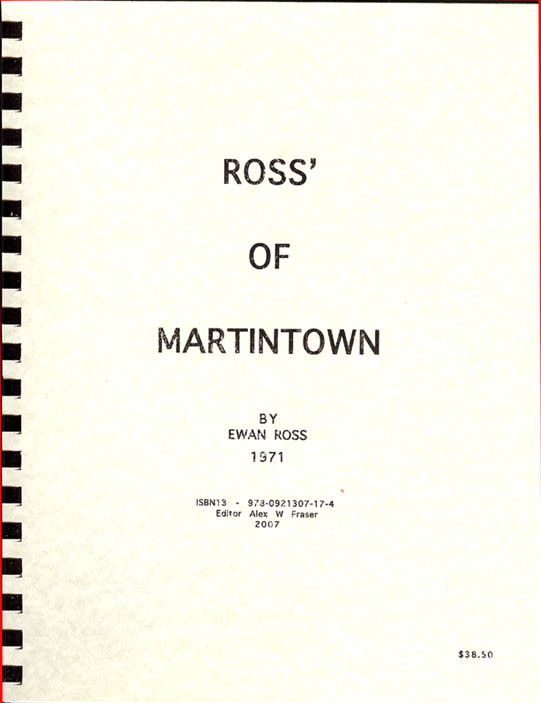 Page 42 - Martintown and Its bridges. Page 42 - John Sandfield MacDonald; The Development of Local Government; the dates of building of some local houses; the boom following the Reciprocity Treaty of 1854. Page	44 - Resume of what Gen. 4 did. Page 44 - Gen. 5 introduced. Page 45 - Dan Ross' search for gold In B.C. and loss of his farm. Page 45 - The forced move to Con. VII and Sis becomes "Manager". Page 45 - Alex's Character. Page 46 - How they lived and made their money. Page 48 - Their furniture, tools and new Implements. Page 49 - Gen. 6 takes its place and Sis dies. Part 1V --- Today - 1970 Page 51. Page	51 - The Family In 1940 and Gen. 7 appears. Page 51 - Weaknesses in the Family Financial Structure. Page 52 - The Dirty Thirties. Page 52 - Local Education in the 30's and 40s. Page 53 - Gen. 7 leaves home, marries and starts families. Page 54 - The Move back to the King's Road. Page 54 - Changes In Ross Farming from 1863 to 1970. Page 55 - Overall picture of Changes and Trends. Page 56 - In Memoriam. Page	58 - Map of Ross Land Holdings in Glengarry. Page 84 ---- Descendants of Catherine Ross and James MacIntyre. Page 85 ---- Descendants of Nancy Ross and John MacArthur. Page 86 - 90 - Descendants of Duncan Ross and Janet Mowat. Page 92 - 93 - Descendants of Christy Ross and John MacIntyre. Page 94 - 98 - Descendants of Alexander Ross and Elizabeth McMillan. Page 99 ---- Descendants of Margaret Ross and John McLeod. Page 101 - 103 - Descendants of Finley Ross and Mary Robertson.